What the heck is Trespasser? Once they had the first main concept ideas together, they simply drew a few first concept art images and represented their work on the E3 (one of the biggest game development congresses per year). Of course they got a lot of feedback to this all. Not only that their ideas were great, but also that their Graphics Engine was so revolutionary by that time , that people were totally overwhelmed by it. One of the reason was, that there was no other engine even coming close to this one. The Quake1 used to be the newest Engine back then and did not even feature big outdoor terrain as the Trespasser-Engine did. Anyways, time passed by and more and more magazines interviewed actual Game Designers. That lead to the point were more and more “secret ideas” were being told and made public. Thus the programmers had to implement more and more features into the game and the team cornered itself more and more. Not only that there were way too many features on the to-do list now, they were also running out of time. This game was being in production for over two years now and the Game Developers were still fighting many problems. For example that the Physics Engine would mess up at many points in the game and would slow the entire game down. Then again the Graphics Engine had to handle too many Objects and would slow down as well. Too make things short, the developers finally decided to make the game half-way stable and to sell it as it was, but to improve the game later on with patches. 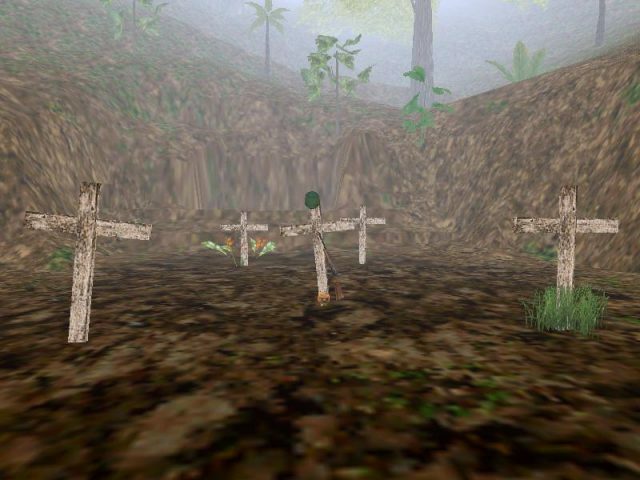 To make the game stable, they had to disallow dinosaurs to enter buildings (otherwise they would get stuck in the doors and walls), exclude a couple of dinosaurs activities, such as allowing them to jump-attack, and to cut out an entire level (“the Pine Valley”) , simply because the player would not be able to handle all the puzzles in that level and many more. Up to this point people would still await one of the best games ever created. So when the DreamWorks Interactive released the game and sent the first few beta versions away to Game magazines, it was not the game that everybody expected and therefore it got bad reviews everywhere. Not only because of the fact, that DreamWorks couldn’t live up to the promise being made, but also because of the game engine, which was simply to much for computers back then and made the entire game unplayable. Now back to the questions, Trespasser is a computer game, which could have been the most realistic and greatest game ever, but which was rushed out way to fast! The reason why you might have never heard of it, is simply because it didn’t sell itself well (only around 50.000 copies were sold) And why we spend so much time on this game is because of the same reason. Maybe we are able to make this game to what it could have been. And we are getting closer day by day, soon we might have a game editor (TresEd is getting better and better day by day . And from version to version it features more functions) and are gonna be able to recreate the lost level.